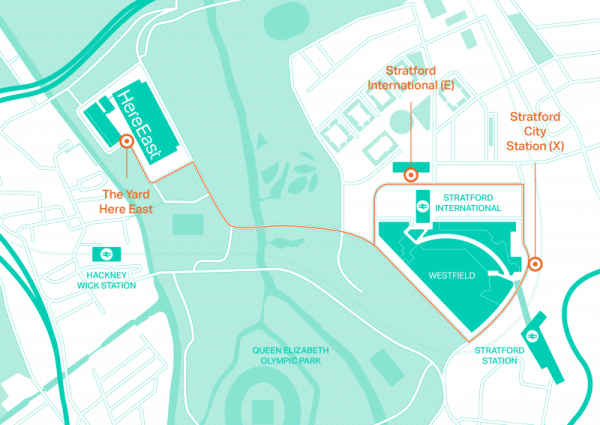 Directions to BT Studios and Timeline Stratford - Timeline Television Ltd.
BT Studios and Timeline Stratford are located within the BT Sport broadcast facility and form part of the Here East development on the Queen Elizabeth Olympic Park. BT Studios are easily accessible from the Here East entrance off Lesney Avenue. The closest train stations to BT Sport are Hackney Wick (walking distance), Stratford Underground and Stratford International stations. Stratford Underground Station: Exit the station by Westfield Shopping Centre and immediately cross Montfichet Road at the pedestrian crossing. Turn left and Here East Buses pick-up every 10 minutes from Bus Stop X.
Stratford International Station: Bus stop E is just by Stratford International DLR station on International Way. Here East shuttle buses don’t operate on Sundays. Travel by car: Parking is extremely limited at Here East so we recommend that you park at the Westfield Shopping Centre in Stratford and catch the free ‘Here East’ shuttle bus to BT Sport (see above). Travel by Public Bus: The 388 bus picks at Stratford City Bus station and stops at the Copper Box on Waterden Road and outside the Here East building on Lesney Avenue.